Weather forecast: It is supposed to heat up significantly by the time the second girl's race rolls around. Expect the climes to be near its peak of 50-55F. Belvidere North may have had a setback or two during the regular season, but keep in mind that they are the defending state champs and ready to roll. Led by Gianna Sagona (Jr.) 17:41, Madison Diercks (Jr.) 18:02, and Sydnie Elder (So.) 18:24 at the Woodstock North Sectional, it was an easy 68-98 win over #1 Vernon Hills. The key here is health and the Blue Thunder is completely locked and loaded. This team has front-runners and a solid pack to finish things off. Vernon Hills is on the verge of winning a title but as a team, they will need to be at their very best. Since pack running is the Cougars forte, the bottom half will need to move up front and solidify things. That did not happen against Belvidere North. Senior Payton Makowskyj was not in her usual spot and the fourth and fifth runners were back as well. This is a wide-open championship for the third trophy. Let's see if sectional champs Burlington Central and Glenwood-Chatham can fight for a position. But realistically look for Mahomet-Seymour and Prairie Ridge to duke it out for the final one. Individually, freshman Lianna Surtz of Aurora Rosary is in the driver's seat. She has been lights out ever since placing seventh at the early season Richard Spring Invitational. 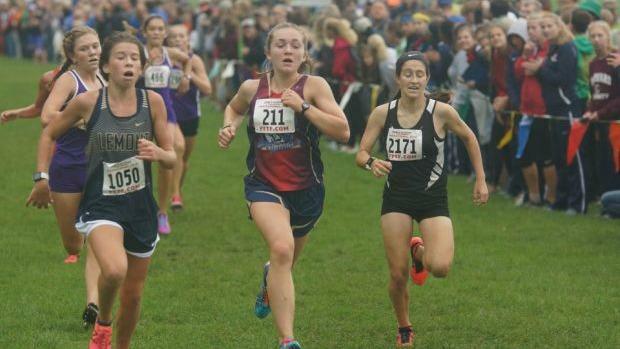 She has a personal best of 17:02 and will be very difficult to beat. But do not sleep on sophomore Brooke Stromsland of Lakes. She has been running exceptional of late with big victories. One of those wins was against freshman Aly Negovetich of Grant. Negovetich is a premier runner at the 3A level. Stromsland will have the spirited backing of her team that did not make it down. And please do not forget the defending state champion senior Jenna Schwartz of Waterloo. She has been possessed on the running course for about a month now. Others to consider for the crown are senior Aspen Gordon of Morton and freshman Ava Parekh of Chicago Latin. It is going to very interesting in the final stages of the race.